Your name can literally save and heal lives. In fact, when you register as an organ, eye and tissue donor you can save up to eight people, give sight to two people and heal up to seventy-five people. That’s why we’re inviting everyone to give something unique—their names. 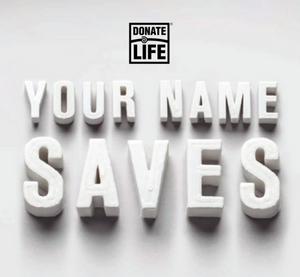 This unique campaign is called Your Name Saves and it highlights the names hidden within your own as a metaphor of all the lives you have the potential to touch as a registered organ, eye and tissue donor. 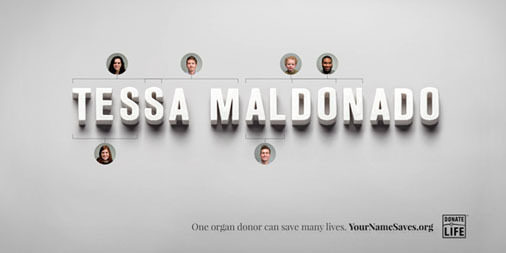 See how many names are in yours at YourNameSaves.org , and then easily register to be a donor, turning the metaphor into a reality. Then, post to social media and invite your friends and family to do the same. But, why stop there? Share YourNameSaves.org with all the people in your circle, like co-workers, fellow congregants, neighbors, and classmates. Email your favorite celebrity, news personality or sports figure and ask them to participate. Having a holiday party? Offer a festive prize for the person who has the most names! It’s easy, free and takes only a few moments but could save the life of someone whose name is on the transplant waiting list. What’s in a name? The gift of life, that’s what! Previous Previous post: We Just Turned 9 Million!